"Take yourself to your own edge." Today I did just that: I stepped (or perhaps dove head first) outside my comfort zone, and perhaps right over my own edge! But I think my pedometer shall be pleased, as I embark upon my new adventure. I have joined a team of outdoorsy gals who have decided to find their own edges for the sake of a worthy cause. It's official ~ we've signed up as "Green Chicks 4 Pink" to take part in Washington, DC's "Susan G. Komen 3 Day Walk for the Cure" for Breast Cancer. Come this September 23rd to the 25th, we'll be donning our pink shirts, our walking shoes, our pedometers, and hopefully our padded donation envelopes to tackle the 60 miles trek to work to eradicate breast cancer. Funny.. it is either the 7 months to the event or my own naivety, I'm not so worried about the walking itself. I have decent endurance, and I'm not running (oh, the horrors that would be!). My hope is that hefty training (and a lot of willpower) will help with that as well...not to mention helping to shed a pound or two. It's the $2300 funds that I need to raise in order to participate that leave me feeling a tad daunted. However, a former teacher friend of mine told me it was kind of like "Field of Dreams," in that it was one of the best experiences that she's ever had, DO IT, and everything else will fall into place. It's at that place where you start to leap. And with gung-ho partners in crime, how can you help but do anything other than leap? Stay tuned periodically while I'm leaping over here with my "Green Chicks 4 Pink." I see it as my own personal quest and invitation for outdoor education! (Perhaps it should be Richard Louv's sequel: "No Moms Left Inside.") I'll keep you posted...and with any luck, have pictures galore from my September adventure for a very important cause. "Approximately 1 in 7 American women will be diagnosed with breast cancer in her lifetime, and more than 2 million Americans are living with breast cancer today." Pink ribbon image from http://www.thedarkersideofpink.org/. 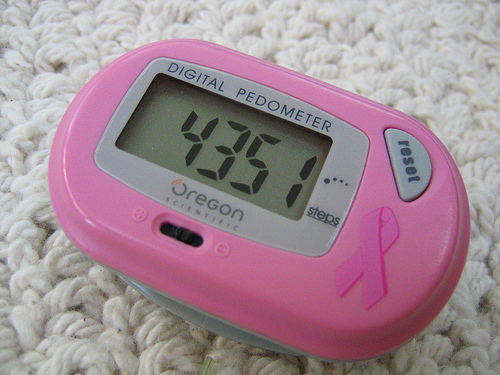 Pink pedometer image from http://www.flickr.com/photos/knit_anon_k/1543419232/.